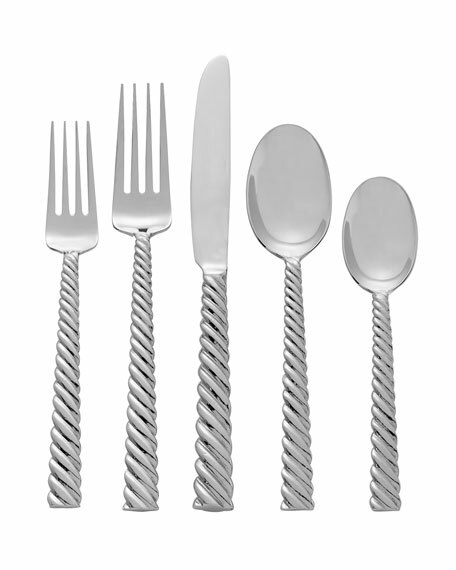 Handcrafted stainless steel flatware set. 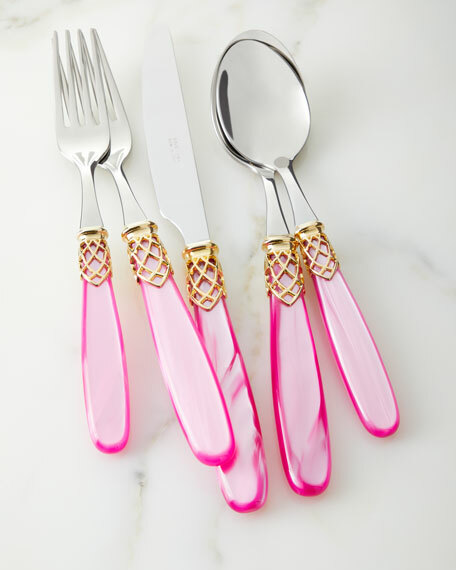 5-piece set includes salad fork, dinner fork, knife, table spoon, and tea spoon. 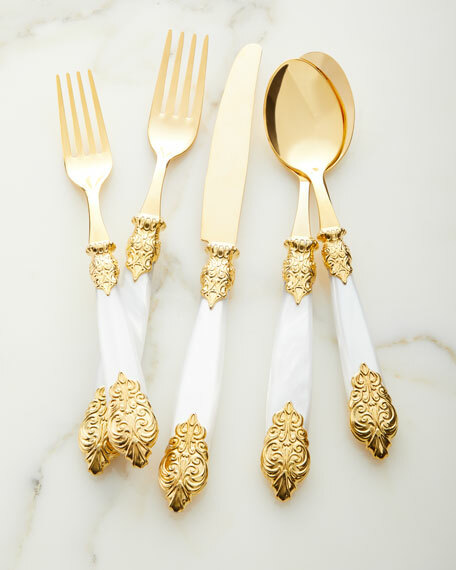 Approximate dimensions: salad fork 7.5"L; dinner fork 8.25"L; knife 9"L; table spoon 7.5"L; tea spoon 6.5"L.
The Twist collection is inspired by the idea that the whole can be far greater than the sum of its parts. When elements are combined, they take on another feeling, a greatness. Together, they are strong, but also I would argue, more beautiful. When lines are repeated, or wires woven, there is a loveliness to the pattern that fascinates and pleases. A symmetry is created that is calming and classical. "I often explore materials and create collections which are craft based. Twist was created while experimenting with intertwining wires. There is a fluidity and movement to the twists that I love. The twisted wires suggest a coming together of things that I find poetic." 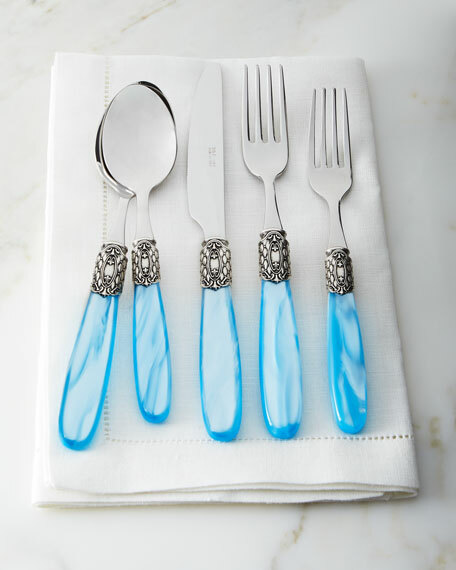 Handcrafted flatware set with ornate metal ring trim. 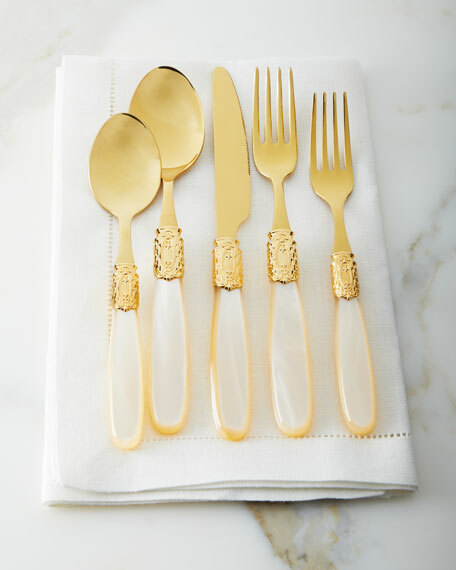 20-piece set includes four five-piece place settings. Acrylic handles with pearl effect. Forged of 18/10 stainless steel. 2.5mm thick steel. Dishwasher safe. Made in Italy.